With me playing four different Pathfinder campaigns now gulp, it’s going to be tough to keep session reports posted in a timely fashion, but I’ll do my best! I’ll post reports for the two games that I GM, today for my online campaign Legacy of Fire. At the end of the first session, the leader of the Kelmarane expedition, the merchant princess Lady Almah Rovashki, tasked our intrepid heroes to find her one of the pugwampis and prove that Dashki wasn’t lying. The group left camp in the middle of the night to do just that and found Dashki not the slightest bit helpful. In fact, he was more than happy to taunt the group and not provide any helpful clues as to where to find a pugwampi. The gunslinger Qusai started to threaten him with shooting his foot off if he didn’t do anything whereas the paladin tried the more gentle route of persuading him to help for Lady Almah. He half-heartedly tried to find tracks, without any success. Fed up with him, Qusai decided to look for tracks himself, and managed to find tiny footprints that Dashki was quick to claim were a pugwampis. 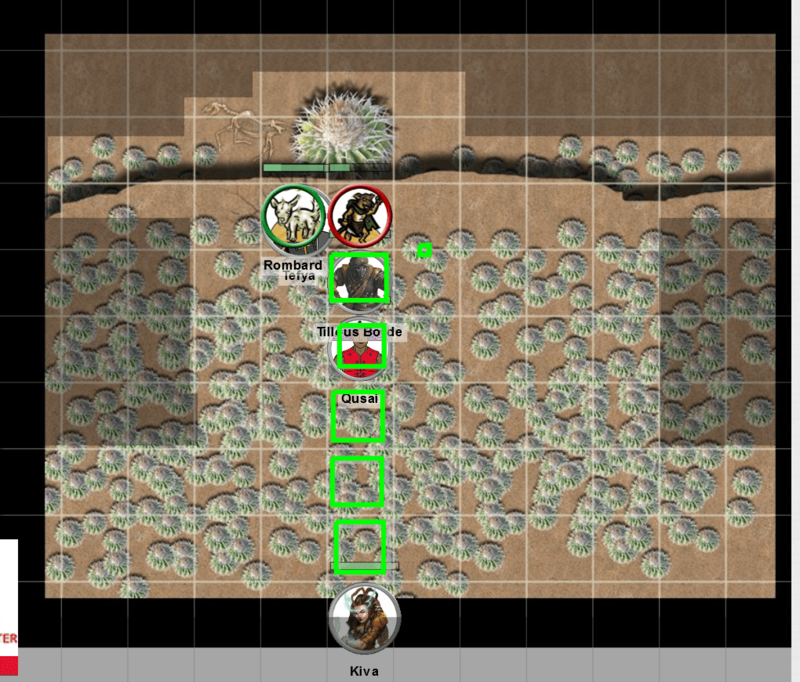 The group stumbled through the rolling foothills of the Katapesh desert following those tracks, eventually being led to a giant field of cacti that gave them an ominous feeling of doom. So many spiky cacti to impale yourself on. Next came one of the most fun introductory and probably most frustrating encounters ever: meet the pugwampi. The pugwampi who had indeed started the fire in camp had abducted Rombard, the beloved baby goat of the camel drivers. Pugwampis are a kind of gremlin that literally radiate unluck. In game terms this means that every single check has to be rolled twice, and it’s always the lower number that counts. To move through the cacti, the players had to do a successful Acrobatics check or take 1 point of damage from the cacti. As this was difficult terrain, they were moving at half-speed. I also allowed them to attack the cacti, and even gave the cacti a relatively low AC of 10. And yet, the aura of unluck did its work. The rogue was the first one to break through the dense growth, at quite a price, as he failed to move past the cacti dexterously, despite being a nimble person. The paladin and the gunslinger used melee weapons to whack at the cacti in a straight line. Qusai had a grand moment of triumph when he tied a rope to his dagger and then did a ranged attack move that will now forever be known as Cactus Dagger Whirlwind Jubilee, tearing down the cacti in his path once. The dwarf alchemist Kiva was smart enough to let the big humans clear the way and followed carefully through areas that had been cleared (on the above map the squares with green were cleared), only getting bolder when they were nearly through the patch. At the end of the field was a ravine, and far below, a deadly-looking cactus was gleaming in the moonlight, waiting for enemies to impale themselves on its spines. The abducted goat was tied to a scrub by the ravine, crying pitifully. Kiva tried to calm down the poor goat who appeared to be bleeding from being dragged through the cactus field, but did not do a great job at it. The goat ran in circles around her and managed to trip her so that her head was hanging over the edge of the ravine, right above the giant cactus. The paladin Tefya also did not manage to calm the panicked goat and Qusai failed to cut the goat’s rope. Kiva, alchemist that she is, tried to remove one danger by throwing down a flask of acid onto the cactus below her, which made another creature elicit a snarl and howl in terror at such sizzling dangers: a pugwampi that had been hiding behind a rock near the goat, not perceived by any of the party members so far! Looking like an ugly little dog on two legs, the creature started to attack the party. Qusai was quick on his feet and shot his musket at the creature, but the shot went high into the night sky. Tefya called upon Sarenrae’s might to smite this evil creature and got a good hit in with her scimitar. Kiva then decided to grapple the creature and succeeded, but Qusai’s attempts to tie up the creature were not met with success. It required the more deft hands of the rogue Tillous to tie the creature up. 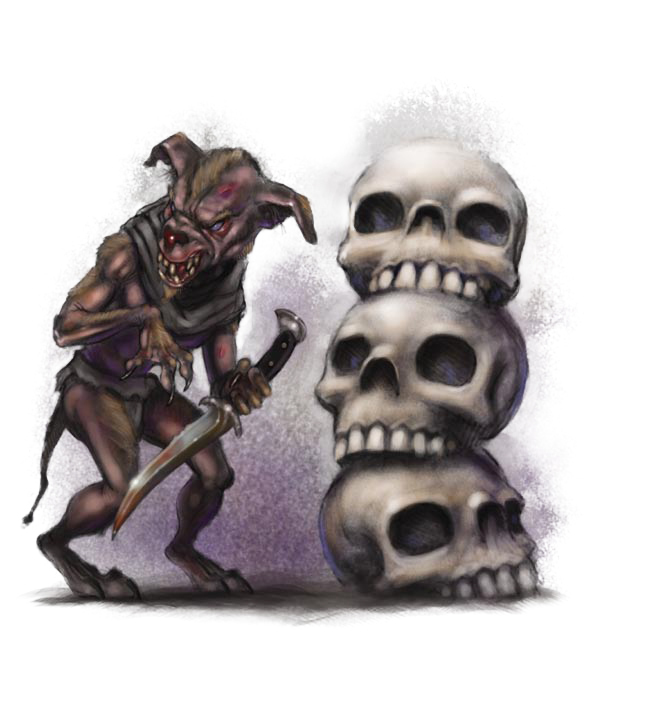 To end their unlucky streak, Tefya then gave the pugwampi a good whack on the head to knock the creature unconscious, the aura of bad luck and doom lifting immediately. The group then freed Rombard the goat and wandered back to camp, where the cowardly Dashki was quick to claim that he had captured the pugwampi for Lady Almah. The party reported how things really went down, which caused Lady Almah to be quick about ordering her majordomo to kill the pugwampi, which he did immediately. Dashki received the corpse, which he tied to his quarterstaff hanging from a noose, as his good luck charm. Lady Almah decided that this camp was not safe if there are really that many pugwampis out there and made the executive decision that the expedition needed a better camp to stage their conquest of Kelmarane from. She informed the group that the deserted monastery of St. Vardishal, dedicated to Sarenrae is in the vicinity, and that the party is to visit the monastery, clear it of any possible threats and claim it for the expedition.